Steering Stabilizer kit for the Model T and Model A. One end clamps on the tie rod, and the end mounts to the front axle. You do not have to drill a hole through the axle to mount this unit. This unit dampens the steering and gets rid of that nasty shimmy. Rear pannard rod for the 1928-31 Model A Ford. Performs the same job as the front pannard bar except this mounts to the rear. One end attaches to the axle center section and the other bracket attaches to frame. The bracket does require one hole to be drilled in bottom of the frame. Note: Can not be used with the modern style shock absorber kit. made in USA. 2 litres of 600W transmission oil. 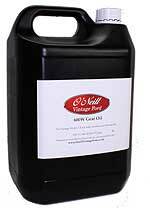 This is the thick oil that is used in the back axle, gearbox and the steering box on the Model A Ford.